It’s not over until Lightning strikes. 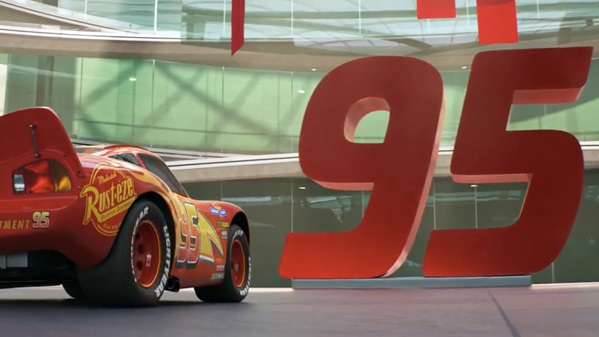 Disney-Pixar have revealed a new 90-second sneak preview trailer for Cars 3, the latest sequel from Pixar arriving in theaters this summer. We've already seen one attention-grabbing trailer and an intro to the villains, but this trailer finally show part of the story. Lightning has to figure out how to make a big comeback after a disastrous crash, along with new high tech race cars making him obsolete. Owen Wilson returns as McQueen, with a voice cast including Armie Hammer, Bonnie Hunt, Tony Shalhoub, Katherine Helmond, and Paul Dooley. I have to say it - this looks damn good, I'm seriously looking forward to this. Might be better than we're all expecting. "I'm coming for you, Storm." These trailers are being put together so well. I am just going to be trepidatious because the last two have been pretty bad. Question: what is its target audience? I like the ominous "This film is not yet rated"
Wow. This looks like it's really well done in regards to both the visuals and the story. I wasn't really into Cars 2 as I didn't see the need to turn them into secret agents. I like that this one is a return to racing.